With almost two decades of successful field application, the ERITECH® System 3000 was enhanced in 2003 with an optimized DYNASPHERE air terminal, ERICORE cable system and supporting design software for a greater protection level. These advancements are a result of research, involving long-term field studies, laboratory testing using some of the largest outdoor test laboratories, and countless research study programs including joint ventures with accomplished scientists in the field resulting in some of the most up to date published technical papers and journals. The System 3000 has evolved from this research activity, with earlier versions of the System 3000 providing a building block for the latest advancements through extensive field studies, leading edge indoor and outdoor high voltage testing and supported by computer modeling research. Collection Volume design principle used by LPSD resulting in the most effective lightning protection coverage. Applications that require the benefit of an isolated protection system would benefit in particular using the ERITECH System 3000. For more advice on the solutions the System 3000 can provide your facility please contact ERICO. The DYNASPHERE has been designed to meet all of the criteria necessary for the controlled emission of a streamer. The concept of controlled is important because it is not effective to launch a streamer too early – the ambient field will not be large enough to convert the streamer to a leader and so the streamer will cease to propagate. The ERITECH® D/SMKIV-SS DYNASPHERE has been developed with these two concepts in mind. 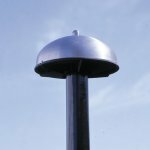 A spherical conductive dome surrounds a central earthed lightning rod. The dome is insulated from the rod but connected to ground via a dynamic variable impedance with DC conduction. It causes a sudden “snap” increase in the electric field immediately above the air terminal, which provides the additional energy to initiate a strong propagating streamer. Because the DYNASPHERE has been designed to meet the criteria necessary for the controlled emission of a streamer, its operation is more reliable than other terminals, particularly when its placement has been optimized for the particular structure by the use of ERICO’s proprietary LPSD Design software.